Amazing Unique Church for rent "ST. CECILIA by the SEA"
Here's a chance to rent an amazing fully furnished house that was once a catholic church. Complete with spectacular stained glass, murals and breathtaking oak woodwork. St. Cecilia has two bedrooms, one of which is an open loft style, a fully equipped kitchen even an outside barbecue! 1-1/2 baths with fresh towels, linens and hair dryer. This is a non-smoking property. For your viewing pleasure we have a large wide screen TV with a selection of over 100 movies and high speed internet. Located in beautiful Purcell's Cove less than ten minutes south of downtown Halifax, a thirty minute cab ride from the Halifax international airport. Conveniently less than 5 minutes to a large fine grocery store and several Restaurants. Across the street is the Purcell's Cove boat and social club, nearby tennis court and beautiful walking trails. Just two minutes down the road is York Redoubt, a National Historic Site with both breathtaking panoramic views of Halifax Harbour and lovely walking trails. Crystal Crescent Beach, one of Nova Scotia's most popular is a mere 20 minutes away.Transit bus stop is conveniently out front with easy connecting routes to all of Halifax's finest destinations. "St. Cecilia by the Sea", cosy, whimsical and guaranteed to lift your spirits!! We are Brett & Lara Ryan. Brett is an award winning singer/songwriter and Lara is a not-for -profit executive. Brett is a Halifax native and Lara is from PEI. We love to travel ourselves and enjoy properties that offer all the comforts of home. We've been in the property business for 20 years and own a number of properties in Halifax and around Purcells Cove but none as unique as St. Cecilia by the Sea. We bought this old church in 2005 and Brett set to restoring it. While working on it he was insipred to write songs in a way that he hadn't for a few years. St. Cecilia, the patron saint of musicians, must have been speaking to him! Not only did he write songs for a great project titled St. Cecilia Soul, he was also inspired to turn the church into a recording studio. The unique space hosted many other recording artists in it's time as a studio as well as was the location for film productions and sound design for many TV series. Alas, our business days in the music industry are coming to an end and recording studios aren't what they used to be. Now, we are thrilled to share this inspirational space with travelers looking to enjoy beautiful Halifax. The drive to downtown Halifax was very easy. It was also very quiet which was very appreciated. Yes...we highly recommend this property for your stay in Nova Scotia! Stunning building with stunning views of the bay. Photos cannot do it justice!! We were welcomed to this home with radiant floor heat which was excellent after a long cold drive! Brett was very kind and responsive, and checked in twice to make sure things were going well and to share some of the building’s history! It truly was a magical week spent there!! Would absolutely recommend it to anyone, and would definitely visit again! Beautiful, relaxing, quiet. The church will be visited again, by my family! Thank you Brett!! This church turned home is THE most calming yet energizing atmosphere EVER! Do NOT miss it! Wherever you live in the world, it is worth a visit to Purcells Cove hidden gem. A unique setting which St Cecilia has to offer is rare to find because it is a treasure. The re-purposing of this 'church to sacred inn' envelopes you in its history. The sensation is comparable to 'going home' to a feeling of cozy safety wrapped in a warm blanket. St. Cecilia-the patroness of musicians certainly approves of the labour of love the owner has painstakingly devoted to this conversion. Whatever you do, do ask the VERY talented and gifted musician owner to tell you his story. Not only is he a kind and humble man but his life path is remarkable. At St Cecilia you will be surrounded by greatness at many levels and will come away refreshed having left your imprint on this magical gem-by-the-sea. This setting along with meeting its owner is the stuff books, memories and bucket lists are made from. Prepare to be dazzled! A truly outstanding experience - not to be missed! Note: musicians bring your instrument because the acoustics are fantastic and St. Cecilia will be singing along from the choir loft!! It doesn't get any better than this!!! Patricia and Mike, thanks so much for the very kind words. It’s people like you that make VRBO/ Home away rewarding on so many levels. I truly enjoyed our engaging conversations and hope that our paths will cross again sometime in the future. 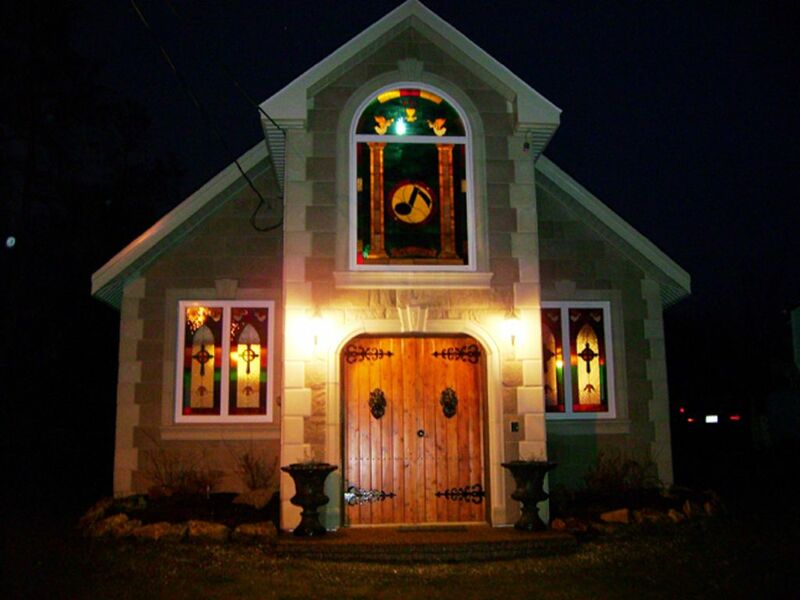 Really quirky converted church rental! Automatic 10 out of 10 from my sister in law for this first pick of our month long vacation!! Absolutely loved staying here. Brett was super friendly and recommend places to go. It was amazing staying in the church with all it's decor and detail. The deck outside was a total bonus. Used it every morning and evening. We felt it was a great central place to stay for all the touring we did. Thanks so much, we had the best time.